So, on my design wall is one little 6 1/2" block. And lots of threads. That is why I cropped the picture, I didn't realize how many threads were on my design wall! I would have more to show, but prepping the ties to make into the fan blades is labor intensive and took a lot of my weekend. I cut enough and worked with them to get one block made. It usually gets me inspired to work on more blocks when I see that first one on my design wall. For more design wall inspiration visit Patchwork Times. 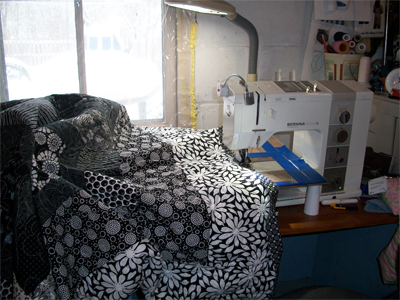 I'm going to give you a peek into my sewing dungeon. I call it that because I sew in an unfinished basement. Also, it has no heat, so winter sewing can be a bit chilly. I do have a little ceramic heater that I use to blow air under the sewing desk, which makes it workable. As you can see, I have a window, so it is not dark and dreary. Though right now, with plastic to help keep the drafts out and a view of lots (and lots) of snow, it isn't as inspiring a view as summertime with flora and fauna to brighten up the day. I will not be sharing the whole sewing dungeon because it is SO terribly messy right now *sigh* While I am creating, I don't see the mess. 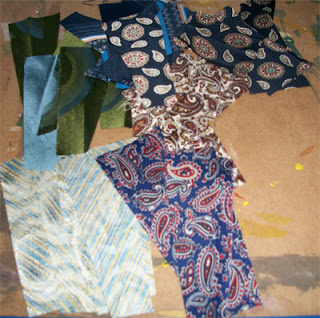 When I'm finished with a project, I'm overwhelmed by the mess and just move on to the next project. So, right now the piles of leftover pieces are pretty high right now (and I'd much rather create than clean). 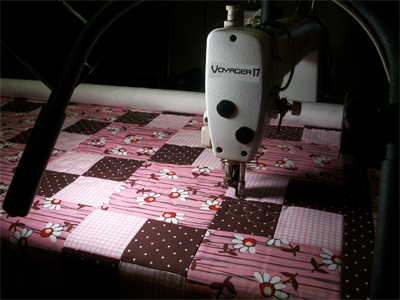 I still haven't bound the daisy baby quilt, but I've got the binding cut and sitting next to the machine, ready to go. It is a fun quilt in Black and White that she is making for her daughter. I've been enjoying working on it because the fabrics are so much fun. I'm hoping Jos likes her quilt! I took Princess Sunshine and the Boybarian to piano lessons today and came home to a garage with 4-5 inches of standing (and expanding) water from a burst water pipe. 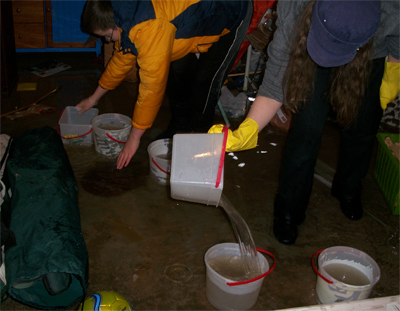 We all got a work out bailing water (the drain seems to be plugged) and sorting through wet boxes. We got the water turned off to most of the house (since most of the water runs past the broken pipe) and the Army Guy ran to Home Depot after work to get a new shut off valve. He took about 10 minutes and had it fixed (I love that guy). 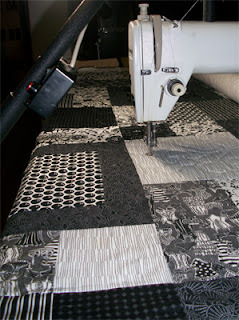 I love having my quilt machine back home! My quilting machine had a need for some TLC so it spent many weeks in Cleveland...the part had to be shipped to the company from there and then shipped back to the service guy. And then I had to find a day to get back over to bring the Voyager back home. Since the Army Guy had Friday off (four day weekend because of the federal holiday on Monday) he took me out for the day. We picked up the machine, went out to lunch and spent some time (and $$) in Borders and then headed home. I spent a bit of time reacquainting myself with the art of frame quilting by quilting the baby quilt this afternoon. Oh, what fun! Baby quilts take almost as much time to load as they do to quilt, so I have the quilting done and will bind it tomorrow afternoon (if I don't nap too long!). 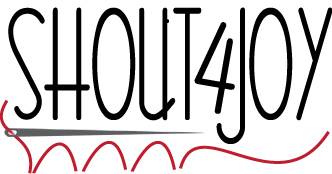 Since I was traveling last Monday, I didn't have anything on my design wall and was unable to post. I also haven't been doing a lot of sewing as I have my quilting machine in the shop and I really hate the thought of quilt tops taking over my sewing dungeon (at least that is my excuse). I did get some quality time with my Bernina over the weekend. It felt SO good! 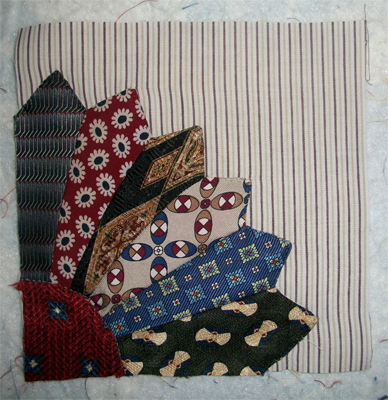 Since I will want something quick and easy to get the feel of quilting on the frame back...I started on a baby quilt. 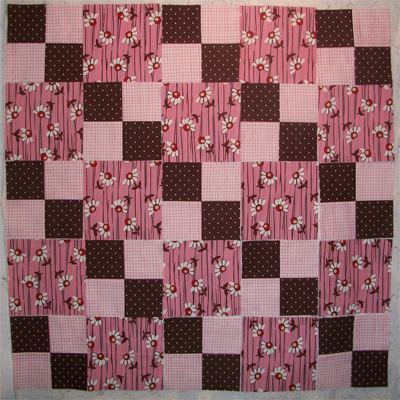 I fell in love with this daisy print and pulled a brown dot and a pink gingham to coordinate and started up. It was hard to leave it unfinished but I had to move on to feeding the family, so there it is, unfinished on my design wall. I am looking forward to later in the week when my Voyager comes home and we can quilt this quilt. I have a lovely black and white from my cousin that is first in the queue. 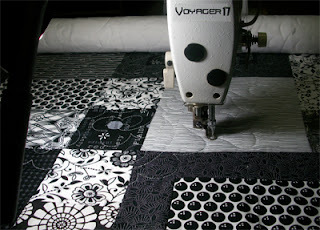 I am excited to work on her quilt...have my freemotion design worked out and that is always when I get excited. Does working out the quilting design do that for you? Check out more design walls at Patchwork Times. do you procrastinate? I sure do! Today is clean the refrigerator and freezer day...and I have been doing anything else in the world. I've read Motor Trends magazine, uploaded a silly video from our Christmas holidays, researched how to clean my bathtub stains, took a couple of online surveys, helped the Boybarian make some Comfrey Salve...I should maybe spend some quality time with my sewing machine, too, don't you think? OK, back to cleaning out the refrigerator *sigh* it will still be there no matter how many other things I do in the meantime.